Gosainkunda Lauribinala pass trek is very famous to explore Red Panda an endanger animal of Nepal Himalayas. An easy to moderate grade Lauribinala pass trek located north from Kathmandu, the capital of Nepal. Lauribinala with Gosainkunda pass trekking presents very good value with excellent Mountain vistas, brilliant landscapes including clean lodge accommodation with good foods. Most importantly, it is less crowded trail compare with other most demanding trek routes of Nepal Himalayas. 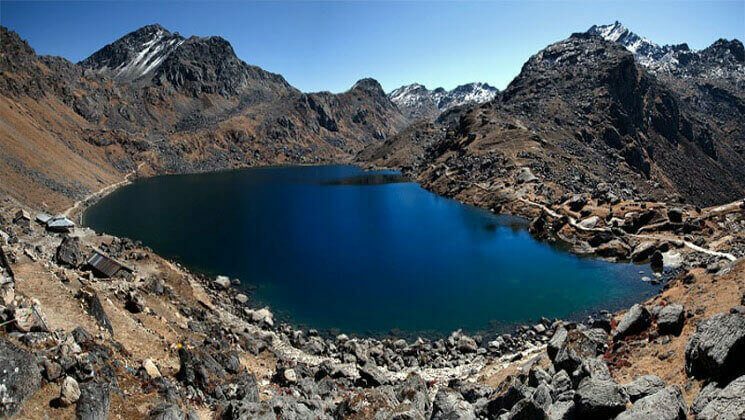 As a result, Gosaikunda is a holy lake, an important pilgrimage destination for Hindus and Buddhist therefore many people visit this place regularly. Besides that, you can walk over moraine and stone rocks to Suryakunda pass 4,630m/15,140 ft and descend downhill walking to Helambu. Hike to Gosaikunda lakes and Suryakunda pass is prominent over the most recent few years. Local people have been fabricated modern lodges with current facilities in a large portion of the spots. If you want me to say the truth, then I must say that you can complete gosaikunda pass trek – 7 days or in 8 days with taking enough rest. You can cross lauribinala continuously Suryakunda pass in all months in all season. Winter time, for example, December, January, February remains more snow and the trail isn’t simple in view of sleeper, cold and sloppy, yet the lodges are opening. Moreover, trek into the March, April, May and June mark as the greatest months to visit in the spring season. The trail is clear and lush with delightful Sun shinning climate. Likewise, September, October, November speaks to the greatest months to visit as well in terms of the best weather. Hiking at gosaikunda pass is more beautiful because of best climate, phenomenal Mountain see, wild orchids blossoms, and blue lakes. Trek in those months, you can see numerous travelers along the trek route. Langtang National Park is the habitat of several wild animals such as Musk deer, Himalayan black bear, snow leopard, Himalayan wild goat and particularly birds and wildflowers. Furthermore, at spring, the trail covered with varieties of alpine wildflowers and the forests are multi-colored with colorful rhododendron, orchids, magnolia, and many other floral species. Besides that, you will have the best view of Langtang Lirung (7246m), Gangchhenpo (6388m), Dokpu (5930m), Naya Kangri (5846m), Yala Peak (5500m) and many others snow-capped mountains, rugged rocks, grassy lands, forested green valleys and as well as holy mountain lakes. Helambu trek is equally popular for its natural beauty and wonderful climate with superb views of magnificent snow-covered mountains and as well as Tibetan Buddhism culture. The area is inhabited by Sherpa and other ethnic groups possessing Buddhist Gompas. Lauribina la trek can be done in any time throughout the year. Special hike Gosainkunda Lauribinala pass includes the pristine glacial lakes along the rocky moraine trail until Suryakunda Phedi. Donot miss to get an awesome mountain view from Suryakunda hill top. Crossing this lauribina la, you can walk downhill to get Phedi. The particular route is designed for world explorer who hike over Lauribina la with glacial lakes but is walking to get an adventure experience within a short span of time than this itinerary would be the best. Have a breakfast at the hotel, drive few minutes to catch up coach for Dunche Bazaar with your mountain trekking guide and porters. Enjoy six our scenic drive through Trishuli bazzar with beautiful tiny villages, river valley and mountains. The bus stops roughly about 30 minutes on highway restaurants for lunch in Trisuli. Than you reached at Dunche bazaar around 2 o’clock midday. Stay overnight in lodge. Day 3Trek ascend to Sing gompa / Chandan Bari (3,330 m / 10,890 ft) 5 hrs. We proceed with stroll through woods incorporates a considerable staircase, in the wake of hiking for around 30 minutes, it’s moving up for around 3 hours until you reach Deurali hill. The following stop if Dhimsa, a couple of hours later passing woods of oak, hemlock, and firs, we reach at Chandanbari or Singompa. Day 9Trek to Sundarijal (1,300m). Drive to Kathmandu city center, 5 hrs. How much does Gosainkunda Lauribinala pass trek cost? Hike to Gosainkunda pass 7 days is available now on USD 550 per person is standard trek price on double occupancy basis. But of course, the trip price will vary according to group size. Question: Do I need the experience to do Gosainkunda Lauribinala pass trek? Question: What opportunities will I have for a shower along express Gosainkunda pass trek? Question: How do I get drinking water on Gosainkunda Lauribinala pass trek? Answer: In this trek route you can get telephone services as well as internet services as well.